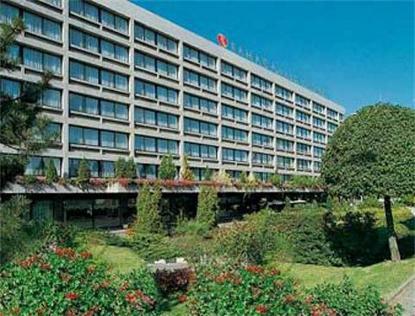 The Crowne Plaza Geneva offers a total of 308 rooms spread over 7 floors. The Ramada features a garden, a bar, two restaurants, a health club, two business centres and a hairdresser, as well as a large banquet and conference centre with 18 pleasant function rooms, holding up to 1000 persons. The Crowne Plaza Geneva is ideally located in the heart of the fastest growing business area of Geneva, near the International Airport, Cointrin Railway Station and Palexpo Exhibition Centre. Free shuttle bus to and from the airport. Taxis and Public transports in front of the property enable you to reach the city centre and the main touristic highlights in a few minutes. Totally equipped, soundproofed and air-conditioned, the rooms are fitted with an ensuite bathroom, direct dial telephone, television with cable network, radio, minibar, safe, water boiler, Internet connection and outlets for PC and fax. The restaurant La Recolte is renowned for its refined cuisine, highlighted by local and seasonal specialties. The restaurant Le Jardin proposes a buffet breakfast and a vast choice of dishes in a relaxing atmosphere at lunchtime. Terrace open all summer. The Marco Polo bar serves a variety of refreshments and light snacks from early in the morning to late at night. Sauna, solarium, fitness and a massage are at the disposal of the customers. In summer, you can take advantage of the swimming pool and tennis courts nearby. Several golf courses in the area. Geneva's largest shopping centre is at walking distance from the Crowne Plaza Geneva.